There are fourteen tyrannosaur tracks that have been discovered worldwide. No less than nine of these have been found within the Tumbler Ridge Global Geopark, while there are three from Alberta, one from Mongolia, and one from New Mexico. Some of the first to be discovered within the Geopark are of great international significance and include the only known tyrannosaur trackways in the world. However, these are in remote, difficult-to-access locations, over seventy kilometres from town. By contrast, the track that Carina Helm discovered on August 30th is less than ten kilometres from Tumbler Ridge, and is easily accessible and potentially recoverable. The day after the discovery Rich McCrea and Lisa Buckley, palaeontologists at the Peace Region Palaeontology Research Centre (PRPRC) in Tumbler Ridge, were able to visit the tracksite, and concluded that the footprint was made by a tyrannosaur (most likely one similar to Albertasaurus). The length of the footprint measures 59 cms, but it was once even longer, as the tip and claw of the longest toe have been eroded away. 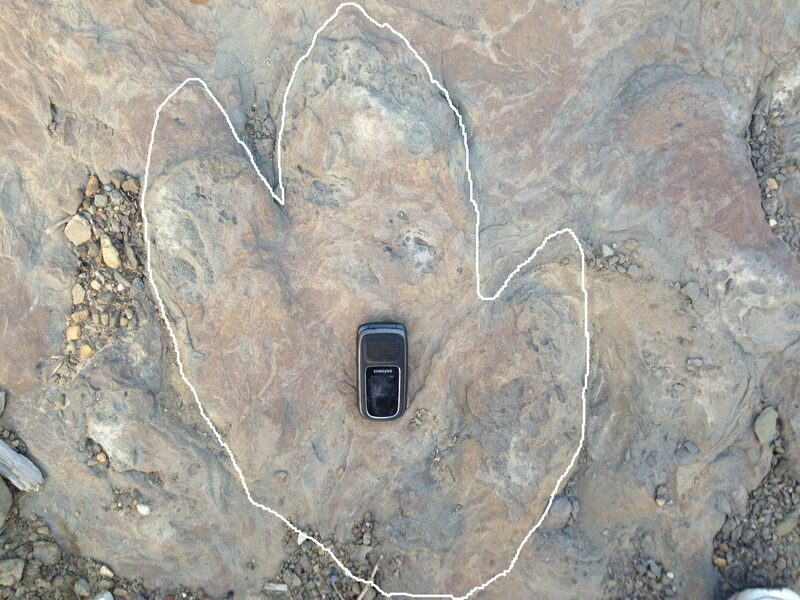 The Tumbler Ridge tyrannosaur track creates a conundrum for the TRMF: promoting it as a roadside attraction seems attractive, but it would be almost certain to get vandalised or stolen. Yet the rock slab is extremely heavy and bringing it into the Museum would pose logistical problems. Regardless, the first steps are to get it properly documented with 3D digital photogrammetry and casting. A Short time later CJDC interviewed Charles Helm regarding the discovery.